Slotter.com is a certified casino website that offers its services in distinguished technology. This guarantees its players a terrific internet casino gaming session. The casino offers its players exciting games with attractive bonuses as well as a 24-hour available customer service in case they get stuck along their way. Slotter.com is a new player in the industry but it is proving to be a great success, mainly because of the fact that they put their players first and they are always open for any questions or comments. Although it is named Slotter.com, which might push some players to believe that the casino only offers slot games, that can’t be any further from the truth. This is because the casino offers its players a great set of games of a varied nature, which include table games, blackjack games, video poker and scratch cards alongside its wide array of slot machines. 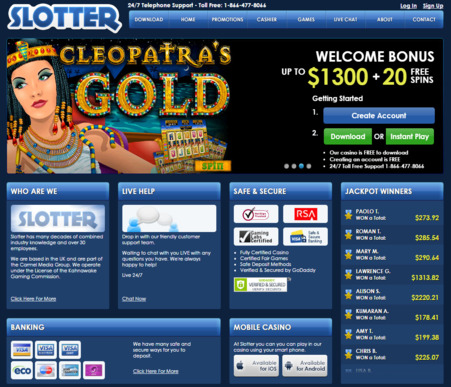 In all, Slotter.com offers players more than 110 amazing games that are powered by Bet On Soft. All of the game code is audited and validated by none other than iTech Labs, which gives players peace of mind knowing that the gaming experience is completely fair and unbiased. All of the casino games are also powered by an advanced RNG system. As for the players’ personal and banking information, they are treated with the upmost care as they are encrypted and stored in secure servers with advanced protection systems to prevent thieves and hackers from accessing it. • The first deposit is matched 100%; the casino will match up to $500. • The second deposit is matched 65% and the casino will match up to $650 and players will earn $15 worth of spins on slot machines. • The third deposit is matched 110% with bonus credit up to $550. • Apart from the welcome package, players will find plenty of rewarding promotional offers such as the Tuesday Reload bonus, $1200 Midweek Special and Mystery Madness to mention a few. The graphics are outstanding, since the entire gaming experience is powered by Bet on Soft. Players can enjoy this experience through the downloadable version or the instant play flash based version. Each version has its pros and cons. The downloadable version offers the entire gaming content but requires a download while the flash version offers less games but it can be enjoyed through any web browser instantly. The customer support service is great, friendly and patient. They have all of the needed knowledge in order to help players face any kind of problems or errors they might be facing. The service is reachable around the clock, 24/7/365, and through a variety of communication means such as Live Chat, email and a toll free phone number. Players can transfer money to their casino accounts through many accepted depositing methods. These methods include Skrill (Moneybookers), Visa Card, MasterCard, Eco Card, Maestro Card; Wire Transfer, Neteller and Solo. The withdrawal methods accepted at Slotter.com include Visa credit Card, Visa Debit, Visa Electron, Solo and Eco Card. Slotter online casino understands how important it is that players have the utmost trust in web based games. Slotter never shares or sells personal information to another person or organization and any transactions made are secure and encrypted meaning that your personal details are safe and secure in the casino. At Slotter, security is a very high priority and they ensure that all personal information is stored with the highest grade encryption available. Their high tech security process gives you peace of mind that all your personal information regarding your credit card details are secure. Slotter.com is certified by iTech Labs and licensed by the authorities of the Netherlands Antilles. Slotter.com puts the players first, and this is why everything about the casino is player oriented. The interface is quite easy to handle, even for new players. Slotter.com also has 110 varied casino games, a $1715 welcome package and plenty of other regular promotions and reload offers. All of this makes for an outstanding online gaming experience.